An increasing trend among professional sports teams is to look towards hybrid techniques to further strengthen their playing surfaces. One of the most popular systems is Desso Grassmaster which uses fibres to make up 3% of the playing surface, bringing it in line with FA rules. 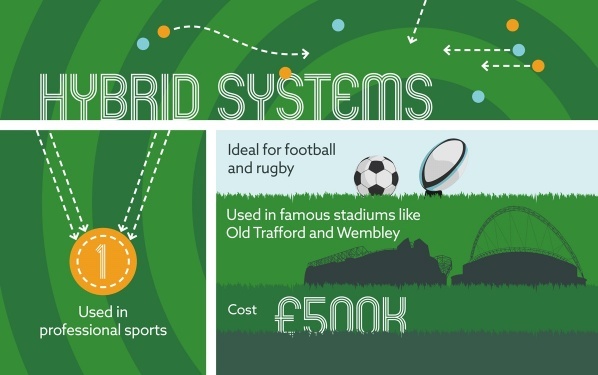 This system is used in some of the most famous stadiums in England including Emirates Stadium, Old Trafford, Stamford Bridge and even Wembley Stadium. The fibres are injected deep into the turf so that the grass intertwines with them as it grows. The result is a surface with enhanced strength, durability and drainage. The largest restriction with this system is the cost, typically around £500,000, which is likely to be prohibitive to all but elite clubs. 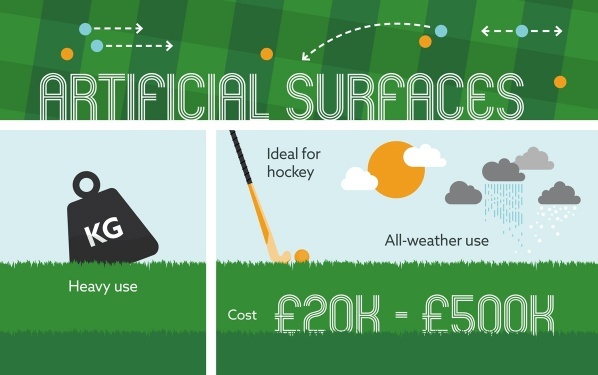 A fully artificial option is to install 2G or 3G (2nd or 3rd generation) pitches, also known as AstroTurf. The most common variants (3G) consist of artificial grass and a surface covered in rubber crumb, which is created from recycled tyres. This addition adds traction to the surface as well as cushioning to protect the players against injury. Other variants use sand in place of the rubber (2G). This type of surface is excellent for all-weather use and has significant durability compared to natural surfaces. The lack of maintainence and consistent surface make it especially useful for sports like hockey which require a pristine surface. However, with a cost from £20,000 to half a million, depending on the type of pitch, the price could be prohibitive. As a fast-growing grass which can thrive in low temperatures, rye grass will deliver good durability and recovery, even during the autumn and winter months. 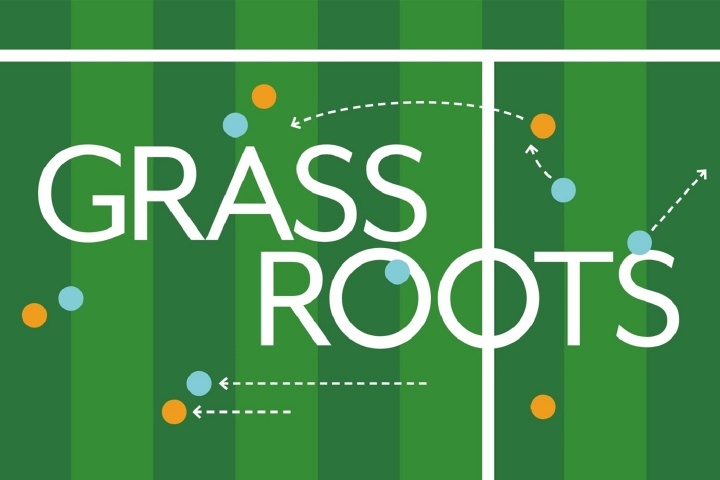 These traits are well known, which is why rye grass is one of the most common choices for pitches all over the world. This also means there are a huge range of varieties for differing needs and environments. Perennial rye grass is the go-to choice for both football and rugby due to its robustness and strength. It is also quick to heal when the ground becomes churned or filled with divots. Rye grass is also the chosen grass for cricket in the UK, but tropical regions of the world opt for varieties of Bermuda grass. Ideal for warmer regions of the world, Bermuda grass is excellent for most sports due to its structure. The grass has many horizontal roots, commonly known as runners (stolons), that connect the grass together, providing additional strength and traction. In addition, these roots grow quickly, increasing the surface's recovery rates. Cricket in warmer regions of the world is widely played on varieties of Bermuda grass, with Bayview Bermuda and Skaapplaas both popular choices. Requiring little maintainence, and able to be cut as short as 3mm, Bermuda grass is also ideal for hockey and open areas of golf courses. However, this grass requires very good sunlight to perform at its best, which means it may not be as effective in low-light environments or cold climates. It can also lose its colour if it is set in the shade. An increasingly popular alternative to rye grass, meadow grass is a viable option for variable climates. Offering a darker colour also means that the pitch presentation is likely to be impressive. A combination of a harder surface and stolons mean that the surface is very durable and a good choice for rugby in particular. The surface will take longer to establish itself and require more maintainence than rye or Bermuda, but its popularity suggests it is worth the extra effort. Not least because it has a self-repairing habit that can help to reduce the need for re-seeding. In addition to natural grasses, there are countless combinations of seed blends and mixtures available, many of which are designed for winter sports or repairing areas of heavy wear and tear. These options can be very useful for patching up surfaces and aiding recovery, but it is still important to select a mix that has been developed around the best grass for your environment. Of course, every groundsman wants to be proud of their pitch. This means that it is vitally important to not just match their choice of seed to the requirements of the sport, but also to the frequency of use, environment, location and level of maintenance required, to ensure a playing surface that is exceptional all year round.